When you’re at a major university, fall revolves around football. Nothing else really matters. I went to an “academic” school in Northwestern, but I still found myself consumed by football. This was a little strange to me because growing up I was 95 percent baseball, 3 percent basketball, and maybe 2 percent football. Those numbers have changed dramatically. Baseball is still my favorite sport, but college football is nipping at its heels. This is by far the hardest sport to broadcast. You’re incredibly far away from the action, and there are 22 guys on the field to keep track of at one time. Preparation for football takes weeks in order to truly do a good job at it. 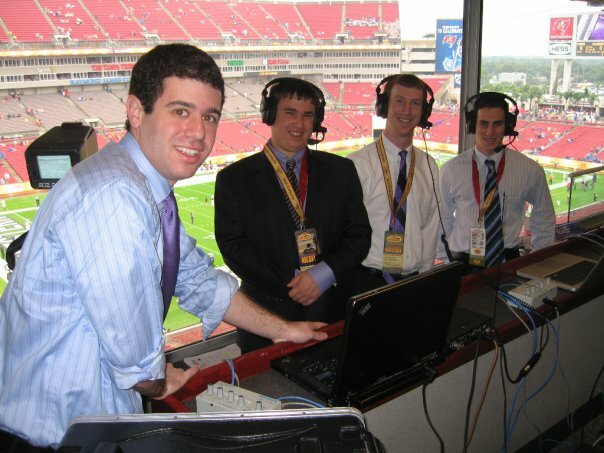 During my time at NU I was lucky enough to be part of the broadcast team for two bowl games, the 2008 Alamo Bowl and the 2010 Outback Bowl. The picture on the left is from before the Outback Bowl. My friends who were also part of the broadcast team: Andrew Gothelf (far right), Kevin Fishbain (second from the right) and Stephen Woldenberg (far left) had no clue what was about to unfold when that photo was taken. Of course, neither did I. The 2010 Outback Bowl was the most incredible football game, college or pro, that I’ve ever witnessed. Unfortunately, Northwestern lost to Auburn, but not before the twists and turns had both teams having victory in their grasp, only to see it slip away. I’m still waiting for that first NU bowl win since 1949. But my time at NU made me fall in love with a sport I barely followed before stepping on the Evanston campus in 2006.